The proposal, announced by the department's Bureau of Land Management, fits within the Trump administration's broader plan to increase energy production on federal lands by rolling back environmental regulation. "With today’s action we have leaned forward to address the various states’ issues, while appropriately ensuring that we will continue to be focused on meaningfully addressing the threats to the Greater Sage-Grouse," he said. Former President Barack Obama's 2015 plan to protect the ground-dwelling bird imposed restrictions to development in their habitat, but in a concession to business groups fell short of placing them on the endangered species list - a move that would have imposed far more rigid rules. Interior Secretary Ryan Zinke last year had ordered a review of protections for the sage grouse to "ensure conservation efforts do not impede local economic opportunities" - one of numerous reviews of Obama-era environmental protections launched by President Donald Trump's administration. Bobby McEnaney, a spokesman for the Natural Resources Defense Council, called the move a "bald-faced giveaway to the oil and gas industry." 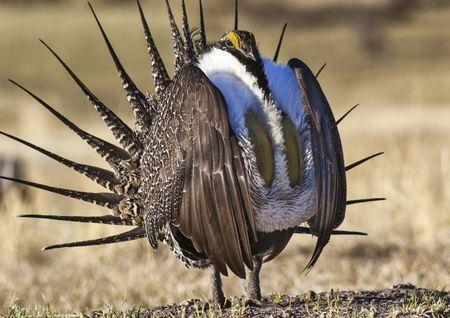 "This rolls back a conservation plan that was carefully crafted by states, ranchers, conservationists and public officials to protect this iconic Western bird and the unique sagebrush landscape it inhabits," he said.